If you’re a beginner blackjack player there are some basic tips and tricks which can vastly improve your success rate. First of all, casino players will notice that most games are shoe games or double-deck Blackjack. It is much rarer to see an affordable single-deck game. However, if you are playing $15 hands of double-deck or shoe blackjack it is often worthwhile to spend a bit more and play $25 single-deck blackjack. Another important point to remember is that single-deck blackjack at online and land casinos are not the same game. 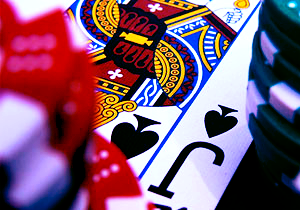 When playing online the single deck is shuffled after every hand which prevents players from getting a read on a deck. However, in land casino blackjack players have the opportunity to get a feel for the deck and remember which cards are left. As with any game, don’t keep playing if you’re not winning. It is possible to lose an indefinite amount of hands of blackjack in a row. Don’t get sucked into playing just because you feel you’re “due” to win. Blackjack is a hugely enjoyable game, but can be immensely frustrating. Just remember to stay within your means and make sure you fully understand the game you’re playing and you’ll soon be having a fantastic time and probably winning.